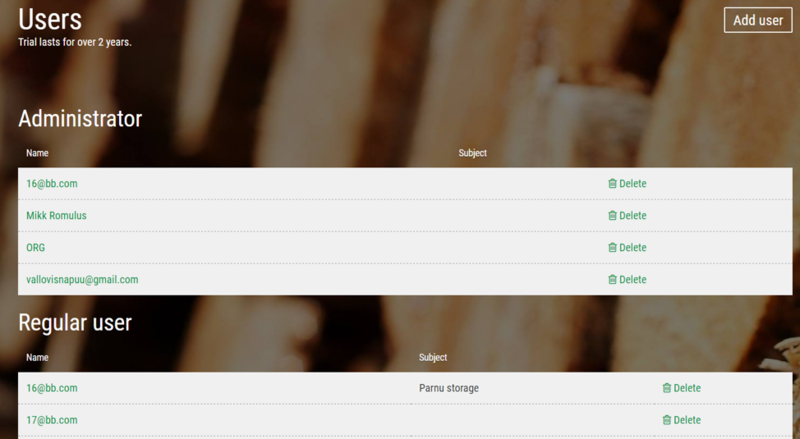 Previously, we have spoken about customizing tree species, wood qualities and reasons of the defect according to your company’s requirements on our Storage Module. This time, we’ll talk about how to manage the users in the storage. By the term users, we mean the ones accessing storage module. These can be bookkeepers, logistic managers or salespeople: anyone can work with the data provided by our solution. It is also worth to mention that Timbeter doesn’t charge for the users: only for devices. However, now, let’s go to a step-by-step users’ management. Primarily, by selecting “users” from Manage menu, you can see all the users and their rights. Users can either be administrators or have standard rights. Administrators have the full rights, meaning that they can add information regarding the species, assortments, and defects, add and manage devices and users. Administrators are also the ones who can modify the results from the storage module. A regular user can only view the information provided. To add a new user, click on “Add user” from upper right needs to be selected and e-mail entered. Added users are by default regular users. To change the role of a user, click on the user’s name and the detailed view of the user’s data will appear. Primarily, the user needs to be deleted from the organization’s overall role so a specific role could be updated to him. 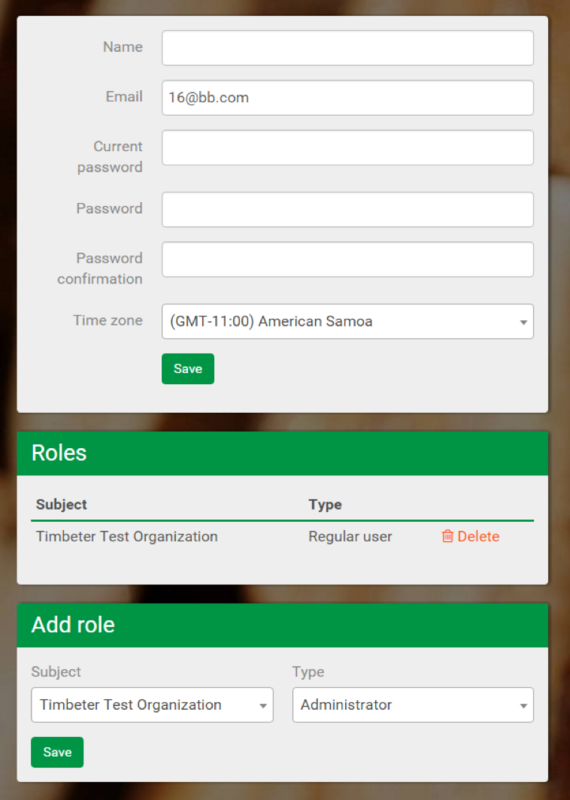 Select Delete from “Roles” to limit the user’s access to the organization’s data. From “Add role” box, select the specific storage from Subject line. 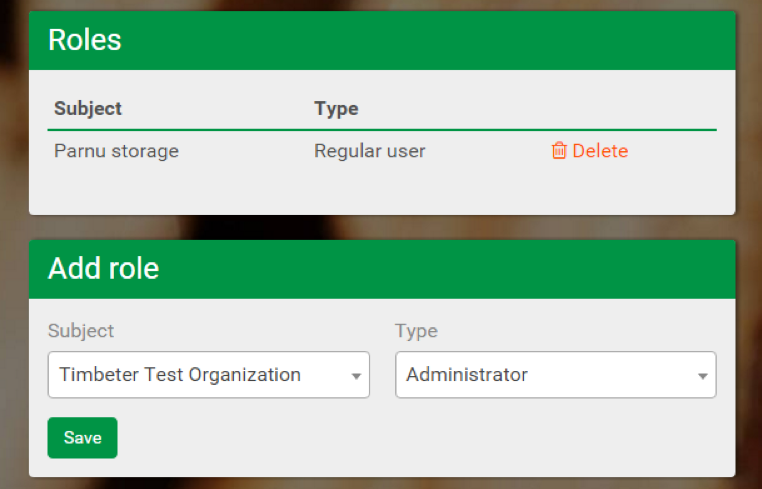 The user can have Administrators rights (can modify results from storage) or be a Regular user (can view the storage, but not change it). In this case, users can access only to Pärnu storage. Hopefully, this was some useful information from our team that helps you to use Timbeter’s data more widely in the company. Let us know if you have any thoughts of what features could be developed in Timbeter’s storage module!